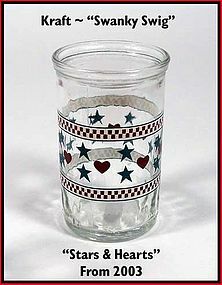 Kraft Foods Swanky Swig 2003 "Stars and Hearts"
This is a newer edition of Swanky Swig by Kraft Foods that came with cheese in it. This was an anniversary release to commemorate the 1950's Swanky Swigs. They are 2 1/4" wide at the top...and they hold 5 oz...Very colorful! 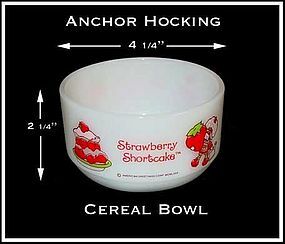 This Strawberry Shortcake cereal bowl was made by Hocking Glasss and is in excellent condition. 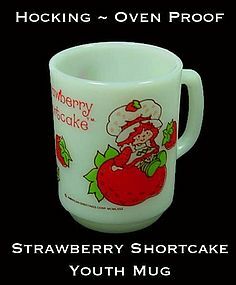 This Hocking Strawberry Shortcake D handle Youth Mug is in excellent condition! 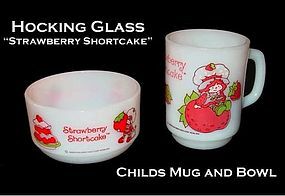 This Strawberry Shortcake mug and bowl set was made by Hocking Glass and is in excellent condition! 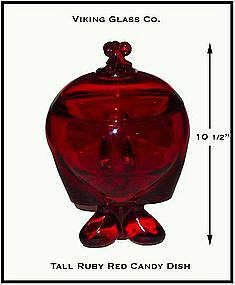 It is marked American Greetings and the Roman Numerals for 1980. Both pieces are marked with the Hocking Anchor! 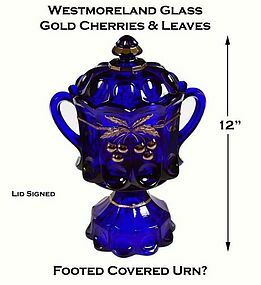 Older Libbey Glass Co. deco design. 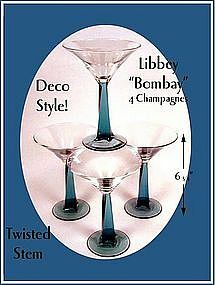 Blue stem "Bombay" Champagne or Martini glass. These are superb! Very now design! 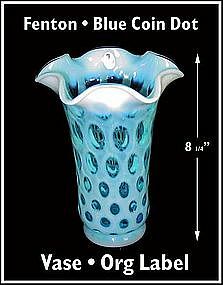 This newer Fenton blue Coin Dot tall vase has it's original label and is marked with the Fenton logo on the bottom. Excellent condition! 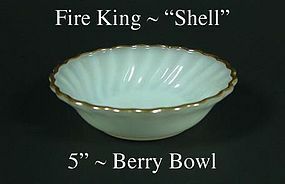 This white Fire King "Shell" berry bowl is in excellent condition! Doesn't appear to have been used. 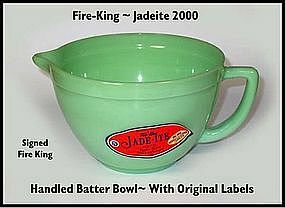 These bowls are getting hard to find. 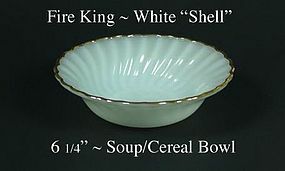 This white Fire King "Shell" flat soup bowl is in excellent condition! Doesn't appear to have been used. 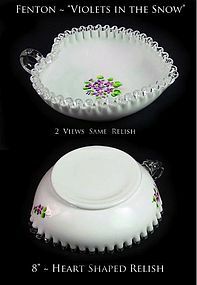 These bowls are getting hard to find. 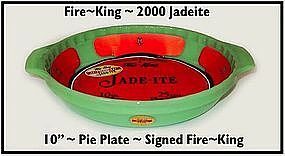 This white Fire King "Shell" soup/salad bowl is in excellent condition! Doesn't appear to have been used. 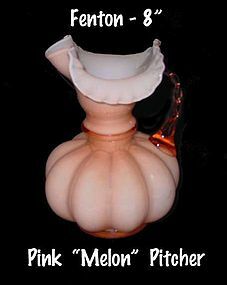 These bowls are getting very hard to find. 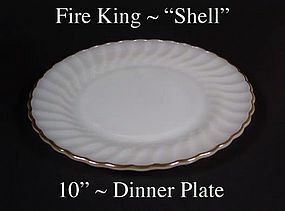 This white Fire King "Shell" 10" dinner plate is in excellent condition! Doesn't appear to have been used much. Very light use. 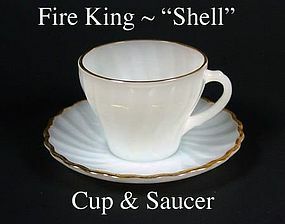 This white Fire King "Shell" cup and saucer is in excellent condition! Doesn't appear to have been used much.